Increasing requirements of industries and research institutes to analytically results of interaction soil-foundation related systems, reveals the importance of the dynamic impedance functions than ever before. The dynamic impedance function relations are presented for mass less rigid foundations which is possible to obtain dynamic response of foundations for different frequencies and masses accordingly. 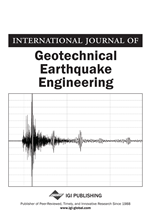 In this study, the dynamic impedance functions were investigated using physical modeling tests on sandy soil with finite thickness soil stratum over bedrock. The tests were carried out inside a steel container of dimensions 1×1×0.8m in length, width and height respectively which was filled into container with Babolsar sand by using air – pluviation technique after calibration test with relative density of 55.1 percent. The selected foundations were square and circular with same surface area and rectangular with length to width ratio of 2 that were investigated to determine effects of shape, inertia, embedment ratio, dynamic force amplitude and bedrock on horizontal impedance. One of the fundamental problems in dynamic soil-structure interaction is the characterization of the dynamic response of surface foundations resting on a soil medium under time-dependent loads. Despite its importance to various soil dynamics and earthquake applications, a clear understanding of the problem has yet to be established owing to the complexity of real soil behavior and its constitutive modeling, the in-situ and stress-induced heterogeneity in the soil’s modulus, and the three-dimensional nature of the underlying wave propagation phenomenon. To provide a basis for improvement, a comprehensive experimental data base that can permit a direct identification of key physical parameters for the problem would clearly be valuable. For such purpose, one should note the dynamic field tests by Dobry & Gazetas (1986), who studied vertical, torsional, horizontal and rocking vibrations of circular and rectangular surface foundations. Some information on the effect of foundation embedment and shape can be found in researches of Stokoe & Richart (1974). In addition to providing important insights into the complex nature of the subject, these field data have been helpful as a direct check of the applicability of relevant theories to practice. As to the use of the field studies for basic research and scientific generalization, however, such an approach is inherently limited due to the significant expenses and technical difficulties in performing systematic parametric variations and characterization of aspects such as soil properties and site formations in the prototype environment. Scaled modeling on the other hand doesn’t present such problems. Owing to the small scale of models, numerous tests with well-defined can be performed at a fraction of the cost of full-scale tests. One of the key steps in the current methods of dynamic analysis of foundation soil system under seismic or machine type loading is to estimate the dynamic impedance functions (spring and dashpot coefficients) associated with rigid but massless foundations. However literature presents experimental results from studying variation of the dynamic impedance function is scanty. In scaled modeling simulation of dynamic problems, however, it is well known that one of the major difficulties is the boundary/box effect caused by desirable wave reflections from the finite boundary of the soil model. Without proper treatment, the latter can contaminated the response to the extent that it may become meaningless. In what follows, a series of physical model tests on the vertical dynamic characterization of surface and embedded foundations in circular, rectangular and square shapes on sand will be presented. The paper includes an analytical synthesis of the results of an extensive parametric study on the effect of foundation contact pressure, footing shape, and footing embedment on the dynamic foundation stiffness as a function of frequency. The subject of vibratory response of foundations has attracted the attention of many researchers since the classical work. The significant advances during the last three decades in developing the theoretical solution to problems of foundation vibrations resting on a thick homogeneous soil deposit has been achieved (e.g. Lysmer & Richart 1966; Gazetas 1983, 1991).Today 2D and 3D solutions of finite element and boundary element methods are available for embedded footings in layered soil deposits. Approximate solutions provide relief from the detailed input and execution of analytical and numerical methods and also provide clarity of the problem that rigorous methods do not allow. The approximate methods include the half-space analogs of Richart, Hall, and Woods (1970) and Cone models are likely the most advanced of the approximate methods for application in engineering practice. Wolf and Deeks (2004) provide a detailed description of the implementation of cone models to foundation vibration problems. Wong and Luco (1978) have presented a detailed tabulation of numerical values for the impedance functions for a massless, rigid, rectangular foundation perfectly bonded to the surface of a viscoelastic, homogeneous half-space. To explore the influence of foundation embedment, Mita and Luco (1989) have presented a detailed tabulation of numerical values for the impedance functions of a massless, rigid, square foundation embedded in and perfectly welded to a viscoelastic, homogeneous half-space. Numerical models using the finite and boundary element method (BEM) are under development for the analysis of wave propagation problems in solids with emphasis on dynamic soil–structure interaction (SSI) due to dynamic excitations.